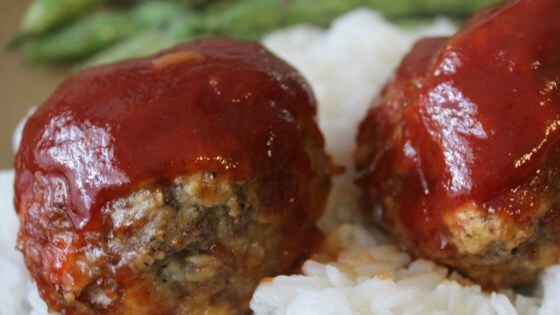 "A sweet, tangy sauce gives these meatballs a wicked delicious taste that guarantees an empty dish at potlucks and several requests for the recipe. This recipe is easily doubled." Mix ground beef, cracker crumbs, chopped onion, milk, eggs, and salt in a large bowl. Roll out 20 meatballs and arrange on a baking sheet with a rim. Whisk together the ketchup, water, brown sugar, and nutmeg in a bowl. Pour mixture over meatballs. Bake in the preheated oven until the meatballs are no longer pink in the center, about 45 minutes. Sauce was a bit too sweet for my taste. If you add some red pepper flakes the flavors of the meatballs become really complex, both sweet and spicy at the same time. They come out really good and taste good with mashed potatoes.